As a conservation scientist, you will work on securing the world’s biological diversity – our flora and fauna, their evolutionary potential and the ecosystem services they provide. Biodiversity underpins human well-being in so many ways – from art and culture to food security. Conservation science combines social science, law, environmental philosophy, economics and scientific reason. Conservation professionals work in the field and office, in government, universities, non-profit organisations and industry, to preserve life and what it can offer to future generations. As a conservation science graduate, you will have the skills and knowledge to work in managerial, educational, research and consultancy roles in government and private sectors. I am a Fisheries Scientist with the Fisheries Queensland (part of the Department of Agriculture and Fisheries), based at the Ecosciences Precinct in Dutton Park, Brisbane. This is a research-based role, meaning that I am able to apply a lot of the scientific knowledge and skills I obtained in my degrees. Apart from my marine science knowledge, I would say the most important skills for this role are experimental design, statistics, writing, and public speaking. While my undergraduate degree provided an excellent foundation for a career in science, my master’s degree provided a fantastic bridge between university science and real-world application. I chose UQ for my undergraduate degree because it had a good reputation for marine science, yet its courses were broad enough to provide me knowledge of science and ecology more generally. I believed this was an important career decision, since it is difficult to predict exactly what jobs will be available after graduation. After years of professional work, I decided to investigate options for a course-based master’s degree that balanced pure and applied sciences; I wanted to further improve my knowledge and skills in a way that would benefit my non-academic career. The master of conservation biology program was in its infancy at that point, but the courses appeared to tick all of the boxes for me; it covered not only statistics, GIS and experimental design, but also conservation policy, industry engagement and philosophy. No other program in Australia matched the breadth of this program. I can honestly say that that degree was a big leap in the direction for my career. I completed a Bachelor of Marine Studies (Marine Biology and Ecology) Hons, and Master of Conservation Biology at UQ. From my undergraduate degree, my general knowledge of marine and ecological science, including how to conduct field and lab-based experiments, were most beneficial. Honours, in particular, gave me great experience conducting scientific research and writing scientific reports, providing me insights into what a career in research sciences might entail. 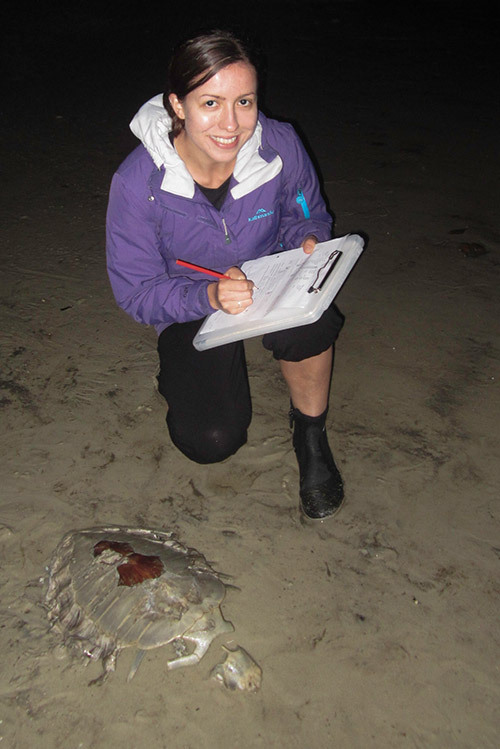 My master’s degree gave me new skills that significantly improved my ability to perform in my professional roles; indeed, it allowed me to be competitive in applying for my current role as a fisheries scientist. I would say the most beneficial skills from this degree were statistics in R, GIS in ArcGIS, writing, public speaking, and environmental philosophy; all mandatory skills in my current role. What I enjoy most is knowing that I am contributing to the long-term sustainably of our finite fisheries resources. I enjoy the creative challenge of finding novel solutions to fisheries problems (e.g. how can we better monitor data deficient species? ), and seeing my ideas come to fruition. Working in the public service means that environmental objectives must be traded-off against other public interests but the work is nonetheless satisfying since this is the reality of environmental decision-making and presents great opportunities to achieve meaningful results. Being awarded first class honours remains an academic highlight for me. During both degrees, I was awarded the Dean’s Commendation for Academic Excellence, an achievement I am particularly proud of for my master’s degree because the challenge and stress of completing a degree in 12 months was unparalleled. Professionally, I am most proud of being awarded a big promotion early in my career, which lead to me being a ‘team leader’ for coastal management wherein I managed a group of staff and oversaw all coastal management issues on the Gold Coast. First and foremost, study what interests you. The rest will sort itself out. If I’d listened to the many people who told me there were no jobs for marine biology graduates, I would be in a very different position to what I am now. I’m glad I didn’t listen. But being successful requires a lot of hard work. Study hard (especially the difficult subjects – e.g. statistics), take opportunities that present themselves (I spent years volunteering in labs and in the field, and outside of university), and be proactive in putting yourself out there. Networking is very important. Learn to communicate well. UQ gives you a lot of excellent opportunities for all of this, so make sure to embrace them.